Paolo Conti :: International Portfolio :: PRO IT Service S.R.L. - Choose a professional and accessible service for your online image! 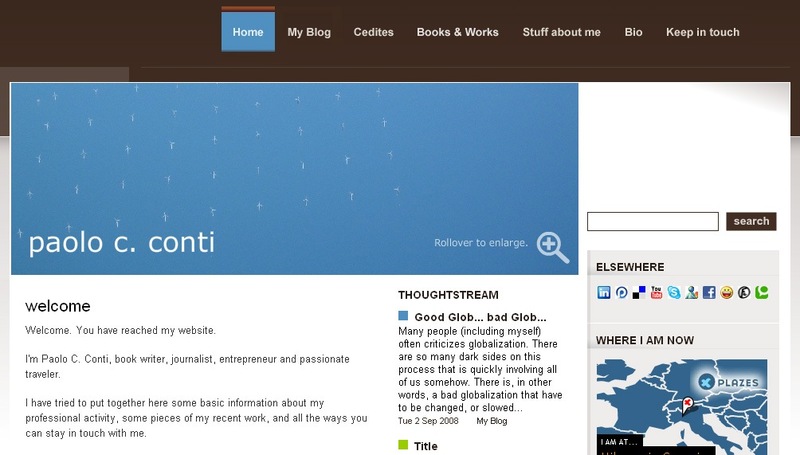 Paolo C. Conti, a reputable Italian journalist, book writer and entrepreneur asked us to build a personal Web site for himself. The project involved building a static like Web site with some blogging features. We've initially designed the web site layout in Adobe Photoshop format, based on some design ideas gathered from the client. After a series of revisions, I've personally hand coded it in xhtml/css, table less format, cross platform compatible. As always, I've carefully built the Web site layout to be Search Engines friendly, injecting keywords, key phrases and proper headings. Once the above were ready, we've installed movable type and integrated the look and feel of the Web site within the platform. The web site is made of a home page, static like pages, blog main page, blog main archives page, categories, monthly archives and individual articles. Statistics are being gathered using Google Analytics. There is also an XML site map sent to Google, Yahoo and MSN which updates itself and alerts these search engines when new content is available so that these new pages will be quickly indexed. Last but not least, users could subscribe to Web site updates using an email subscription form, service provided by FeedBurner. Since Paolo Conti is also a passionate traveler, we've plugged a mod which allows him to update his Web site from inside his iPhone and/or iPod device.